Are you looking for a reliable, innovative dairy partner who knows their trade? Someone who will think with you and stick with you in the long term? Then Konings-Zuivel almost certainly fits the bill. At Konings-Zuivel, we believe in sustainable relationships based on trust: with manufacturers, customers, and all our other partners. Optimising your dairy products and range is a continual process. And Konings-Zuivel is only too happy to help. Thanks to our extensive network, market knowledge, and nearly three decades of experience, our dedicated team is ready to take care of your business and help keep your product range fully up to date. This applies to quality as well as quantity. Konings-Zuivel will show you all of the options. We’ll do this in answer to your query, but also come up with great ideas ourselves. Our professionals have both inquiring minds and a passion for dairy products, always up to speed on the latest trends and developments in the dairy market. So your product range will stay up-to-date and innovatory. Are you a dairy manufacturer looking for a partner who can transport your refrigerated products under the right conditions and deliver on time to the right locations? Konings-Zuivel works to the appropriate safety standards (BRC certified) and has a complex logistics network within Europe. So you can be confident that all your dairy products will reach your customers on time and at the correct temperature. The better we get to know our partners, the more we can do for each other. This can be seen in the cases of ‘Konings-Zuivel and Mars England’ and ‘Konings-Zuivel and Douwe Egberts’. In Konings-Zuivel, Mars England found the distribution partner to supply the European continent with its dairy drinks. 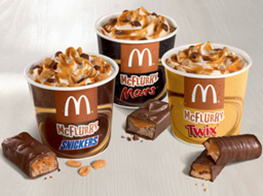 The partnership began several years ago with the ingredients for the McFlurry: the soft ice cream sold at McDonald’s. Konings-Zuivel delivered these ingredients on behalf of Mars England to branches of the fast-food giant, from Moscow to the French overseas territory of New Caledonia. Mars England then decided to introduce Mars Chocolate Drinks to the continent. And it was only natural to expand their collaboration with us. After all, Konings-Zuivel’s lorries were specially designed to transport refrigerated products and our distribution centre in Bergambacht is an excellent intermediate station on the way to the warehouses. 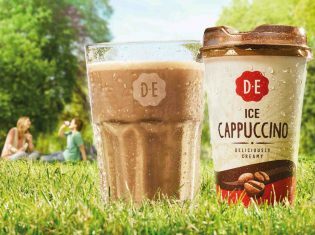 In 2010, Ice Coffee was a new kind of product for the coffee specialist Douwe Egberts. For a number a years, the chilled Ice Coffee Cappuccino and Macchiato has already been picked up, stored, and delivered by Konings-Zuivel. We took care of both the full inventory and the logistics for the refrigerated products of Douwe Egberts.